Should the sprint length in Scrum be fixed or variable? It has been a hot topic of discussion for years but most of the experiences shared by Scrum Masters go in favour of fixed length sprints; and, I too follow the rule of fixed length sprints. According to Agile Cadences and Technical Debt Survey report, 68% Scrum Masters favoured fixed length sprints while 29% accepted to make infrequent changes in the sprint length. Only 7% Scrum Masters accepted to change sprint length frequently as and when required. No doubt, flexible sprint length releases work pressure on the members but this practice develops a number of undesired apparent or hidden snags pertaining to quality, cost, time and scope. Here in this article, I will explore 5 more commonly accepted reasons to adopt fixed-length sprints framework. 1. Teams Benefits from a Regular Rhythm Regular time-boxed delivery is the core Scrum discipline; therefore, we can’t take the liberty to have flexible sprint lengths. In case of flexible sprint lengths, team members are unsure of schedule. The fixed duration sprint benefits the Scrum teams because each member has to be settled with a rhythm. 2. Sprint Planning Becomes Easier The fixed sprint length makes the sprint planning easier because the team members know how much work they are supposed to deliver in the forthcoming sprint. 3. Tracking Velocity Is Easier Tracking Scrum velocity is easier with same length sprints. You can’t be sure of completing twice the amount of work if the one-week sprint period is extended up to two weeks. The alternative practice may be to normalize the velocity on per-week basis, but it seems a needless and complex exercise if the Scrum sprints are kept at the same length. 4. On the Time Course Corrections It is very common to find a gap between the demand of the product manager and the amount of work delivered. Fixed-length sprints minimize that gap by bringing the product manager and engineers together at a fixed interval. The findings at each sprint guide the Scrum team to incorporate the required changes before the particular task is done, tested & documented. 5. Maximizes Responsiveness to Customer Fixed-length sprints improve the responsiveness to customer requests. True, instant turnaround to customer requests is not possible; yet, it can be addressed quickly at priority. The only way to satisfying the customer at the best is to deliver the new feature or to fix the bug quickly in short fixed-length sprint cycles. How to Fix the Ideal Sprint Length – 5 Tips: Ideally, sprint is a fixed time period of 1-4 weeks; it depends upon the team to schedule the sprint. The shorter Sprints spanned for one - two weeks help the Scrum teams identify the problems faster; but sometimes it seems uncomfortable. Many times, Scrum teams decide for the 3 - 4 weeks longer sprints to avoid indulgence towards these problems/ impediments; however, it is not a Scrum-like approach because Scrum principles guide to identify and deal with the problems at the earliest. So, the question is how to fix the ideal sprint length holding the balance between focus and opportunistic adaptiveness. The following 5 tips will help you optimize the sprints schedule: 1. Uncertainty may come in a variety of forms like not properly defined requirements, new technology, high-risk potential, difficult-to-implement interface etc. In case of significant uncertainty, you should go for shorter sprints - the most effective way to refine the project requirements or to try the new technology before getting set for solution development. 2. The volume of tasks and the expected time required affect the selection of sprint length. The team members should be comfortable to accomplish the task to complete a user story during the gap between the two sprints; and, as a Scrum Master, you should have a fair idea of the time required. 3. If you are facing a lot of disruptions, shorten the Sprint length to match the occurrence of disruptions. 4. The project duration is the key deciding factor for Scrum sprint duration. A short-period project such as one of three-month benefits from shorter sprints because of more reviews at shorter periods. If the project is long in duration, continue to look at the other factors. 5. Each Scrum sprint provides an opportunity to the Scrum Master to document the progress to stakeholders. Each sprint provides an opportunity to stakeholders to request for revisions. If you expect the stakeholders to provide input, prefer to set shorter periods for the sprints. Setting your iterations too short in #scrum can have a damaging effect. "Failed" sprints and poor morale. #agile #teams — John Cutler (@johncutlefish) June 10, 2017 Concluding Thoughts: Shorter Sprints are preferred because of many reasons as discussed above but these need to be scheduled perfectly at comfortable intervals so that the sprint planning, sprint reviewing, sprint retrospective can be meaningful. Instead of fixing the sprint length to fit the ‘Product Backlog Items’ size, it is better to make the items smaller. The Certifications like CSM and other project management training and courses provide the deep insights into the perfect sprint planning. Should the sprint length in Scrum be fixed or variable? It has been a hot topic of discussion for years but most of the experiences shared by Scrum Masters go in favour of fixed length sprints; and, I too follow the rule of fixed length sprints. According to Agile Cadences and Technical Debt Survey report, 68% Scrum Masters favoured fixed length sprints while 29% accepted to make infrequent changes in the sprint length. Only 7% Scrum Masters accepted to change sprint length frequently as and when required. No doubt, flexible sprint length releases work pressure on the members but this practice develops a number of undesired apparent or hidden snags pertaining to quality, cost, time and scope. Here in this article, I will explore 5 more commonly accepted reasons to adopt fixed-length sprints framework. Regular time-boxed delivery is the core Scrum discipline; therefore, we can’t take the liberty to have flexible sprint lengths. In case of flexible sprint lengths, team members are unsure of schedule. The fixed duration sprint benefits the Scrum teams because each member has to be settled with a rhythm. The fixed sprint length makes the sprint planning easier because the team members know how much work they are supposed to deliver in the forthcoming sprint. Tracking Scrum velocity is easier with same length sprints. You can’t be sure of completing twice the amount of work if the one-week sprint period is extended up to two weeks. The alternative practice may be to normalize the velocity on per-week basis, but it seems a needless and complex exercise if the Scrum sprints are kept at the same length. It is very common to find a gap between the demand of the product manager and the amount of work delivered. Fixed-length sprints minimize that gap by bringing the product manager and engineers together at a fixed interval. The findings at each sprint guide the Scrum team to incorporate the required changes before the particular task is done, tested & documented. Fixed-length sprints improve the responsiveness to customer requests. True, instant turnaround to customer requests is not possible; yet, it can be addressed quickly at priority. The only way to satisfying the customer at the best is to deliver the new feature or to fix the bug quickly in short fixed-length sprint cycles. 1. Uncertainty may come in a variety of forms like not properly defined requirements, new technology, high-risk potential, difficult-to-implement interface etc. In case of significant uncertainty, you should go for shorter sprints - the most effective way to refine the project requirements or to try the new technology before getting set for solution development. 2. The volume of tasks and the expected time required affect the selection of sprint length. The team members should be comfortable to accomplish the task to complete a user story during the gap between the two sprints; and, as a Scrum Master, you should have a fair idea of the time required. 3. If you are facing a lot of disruptions, shorten the Sprint length to match the occurrence of disruptions. 4. The project duration is the key deciding factor for Scrum sprint duration. A short-period project such as one of three-month benefits from shorter sprints because of more reviews at shorter periods. If the project is long in duration, continue to look at the other factors. 5. Each Scrum sprint provides an opportunity to the Scrum Master to document the progress to stakeholders. Each sprint provides an opportunity to stakeholders to request for revisions. If you expect the stakeholders to provide input, prefer to set shorter periods for the sprints. 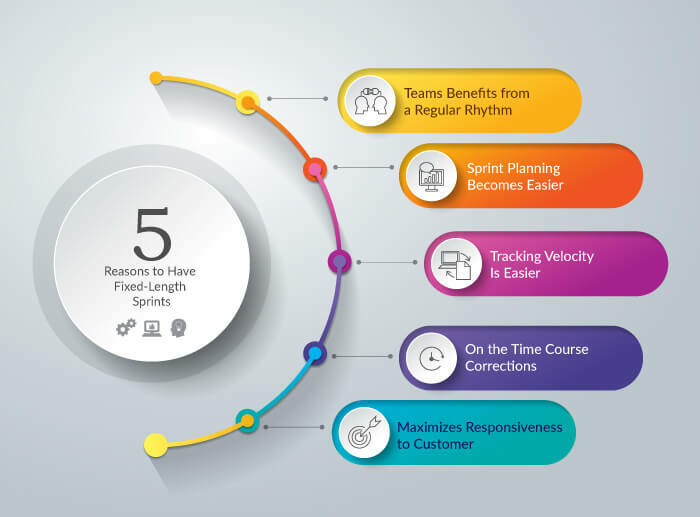 Shorter Sprints are preferred because of many reasons as discussed above but these need to be scheduled perfectly at comfortable intervals so that the sprint planning, sprint reviewing, sprint retrospective can be meaningful. Instead of fixing the sprint length to fit the ‘Product Backlog Items’ size, it is better to make the items smaller. The Certifications like CSM and other project management training and courses provide the deep insights into the perfect sprint planning.